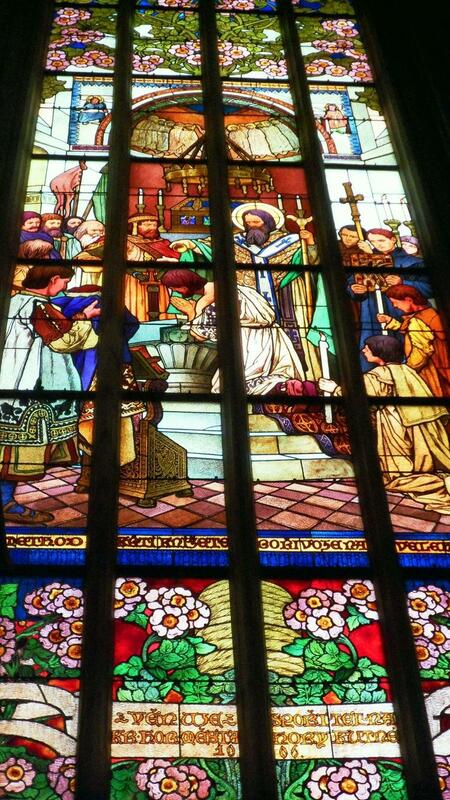 A modern Stained glass Baptism Window at St. Mary’s Episcopal Cathedral in Memphis, Tennessee, created by Len R. Howard, mid-20th Century. Stained Glass is stained or coloured in many different ways. Coloured glass is primarily produced by adding metal oxides during its production. The colour shade is determined by the colourant oxide, its quantity, duration of process, and amounts of oxygen in a kiln, etc. Metal compounds are layered or laid on glass and re-fired to achieve colour. Glasses have been enamelled with a ceramic slip like compounds and fired to achieve colouring. Glass is also painted with transparent colours (soluble dyes) added to ‘clear’ mediums of shellac, oil-Varnish, Lacquers and polyesters. Clear Glass >> Transparent or Ordinary glass is soda-lime glass which appears to be colourless but has a slightly greenish tinge. Green glass >> Deeper bluish-green is achieved by addition of Iron oxide. Chromium provides rich green colour (wine bottle). Tin oxide and Arsenic yield emerald green glass. Red glass >> Red glass has many different shades. Metallic gold produces ruby gold -a rich ruby-coloured glass. In minute quantity it achieves a less intense red -cranberry glass. Pure metallic copper provides a very dark red but opaque glass, though can be used for layering and engraving or abrading it off. Selenium achieves pink and red glass and when used cadmium sulphide, it gives a brilliant red colour -Selenium Ruby. Yellow glass >> Pure yellow was little late to arrive on the scene. Silver nitrate is applied on the readied glass and re-fired to produce yellow to orange to red colours. Iron poly sulphides produces amber glass whereas with calcium it produces deeper yellow. Titanium, employed as co-compound is used to intensify and brighten other colours. Uranium addition gives glass a fluorescent yellow or green colour. Blue glass >> Cobalt in soda-lime glass in soda-lime glass gives a brilliant blue colour such as in Chartres Cathedral. Copper oxide produces a turquoise colour. Nickel, at different proportions provides blue, violet, or black colour. Early colourants that were used include: >> Blues (Cobalt Oxide), Violet and purple (Magnesium Oxide), Red and ruby -turquoise (Copper Oxide), Greens and yellows -reddish (Iron Oxide). Later day colourants include: >> Dark green to black (Chromium), Rich greens (Chromium, tin oxide and arsenic), Deep yellow (Cadmium salts), Yellowish brown (Titanium), Purple (Nickel salts), Burgundy red (Gold) Yellowish orange to red (Silver salts), Whites (Tin oxide and antimony). Glass coloured while in the clay pot in the furnace is known as Pot metal glass. The metal particles are not dissolved into the glass but are well dispersed through the glass mass, creating a uniform colour. Pot glass is used either directly or after it has been toned, ornamented, or made a background for a figure subject by painting the same upon it with vitrifiable pigments, fused to its surface or incorporated with its substance by the means of heat. Some of the colours produced through Pot Metal Glass method are very intense. For example Red is so dark that even at 3mm thickness, it appears black, transmitting very little light. To overcome this problem, one blob of molten glass was picked, and dipped into another coloured or colourless glass, and blown. Alternatively two or more layers of colour are created in one sheet of glass. This is called Flashed glass. Double-layered glasses were often engraved or abraded (ground) to show clear or tinted glass below. This method allowed rich patterns and grains which when appropriately oriented and mixed became part of the composition. 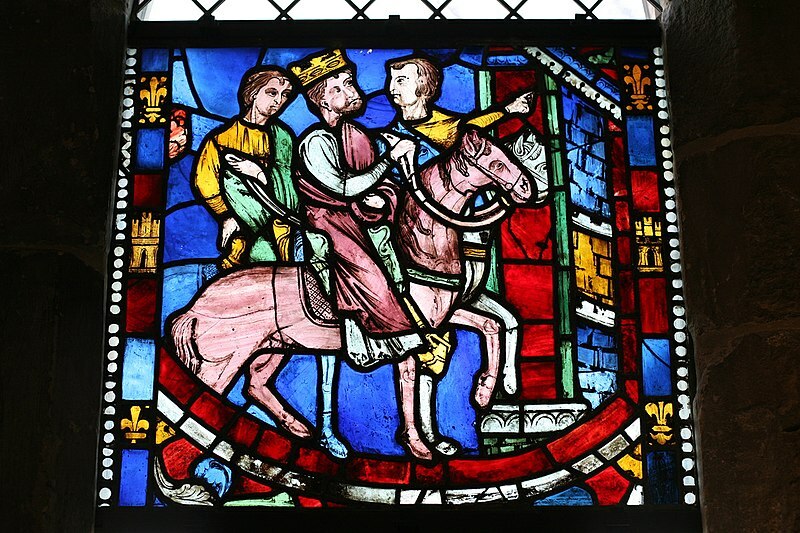 Theodosius Arrives at Ephesus / 12 C French, Rouen / Pot-metal glass, vitreous paint / Metropolitan Museum of Art, New York. This is a type of flashed glass where a dark coloured glass is mixed-streaked into a lighter colour glass, and streaked. Streaking produces grained patterns while increasing its transparency. Streaked patterns have been exploited as part of garments, draperies, natural scenes, water bodies etc. and add patterns into vast extent of plain colours.